Policosanol is a natural supplement derived from sugar cane. It is a mixture of eight higher primary aliphatic alcohols isolated and purified from sugar cane wax. Animal and human studies have also shown that policosanol is an antioxidant. 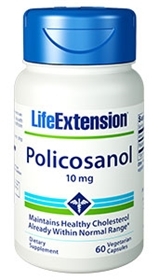 When used in long-term clinical trials, policosanol was well tolerated and safe. This product contains NO milk, egg, fish, peanuts, crustacean shellfish, soybeans, tree nuts, wheat, yeast, gluten, corn, or rice. Contains NO sugar, and no artificial sweeteners, colors, flavors, or preservatives. Take one to two capsules daily with the evening meal, or as recommended by a healthcare practitioner.. Discontinue use if cholesterol levels drop below 160 mg/dL.